By now pretty much everyone knows that our environment is in danger of being irreparably damaged. We often wonder what we can do to save the planet, but the fact of the matter is that modern life can be greatly stressful and time-consuming, so most people just don’t have the energy or free time to do some of the more significant things that need to be done in order to save our planet’s future. That being said, just because some things are tough to do doesn’t mean everything is. There are, in fact, plenty of things that you can do in order to save the planet, even if you are a very lazy person who doesn’t like to put too much effort into any work. You can do things like turning the lights off when you leave a room, or not leaving the tap on while you are brushing your teeth. These are small acts of conservation but if enough people incorporate these habit into their lives, the future of the planet can start looking a great deal brighter. 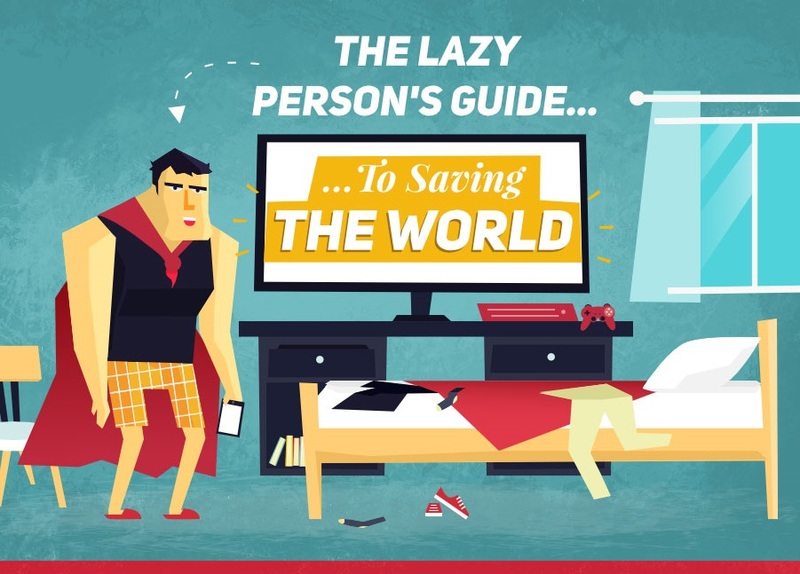 If you are lazy but want to play your part, read the infographic below, “The Lazy Person’s Guide to Saving the World”, which comes courtesy of Wearetop10. Share social media posts that help a good cause. When you share, you spread the word to others and influence people in your circle. Turn off your extra lights. When you are on your computer or watching TV, the screen provides plenty of light. Go paperless. Stop paper statements from your bank and other accounts. Pay bill online. Save a tree. Take showers instead of baths. Bathtubs require gallons more water than a 5 to 10 minute shower. Donate non-perishable foods you don't use to local charities. Feed the hungry and make a donation at the same time. Bike, walk or use public transportation for commuting to and from work or carpool with a group to save money on gas.